Class is not in session in Los Angeles. Teachers of LA Unified School District, the second largest school district in the country, went on strike Monday, putting over 30,000 teachers on the picket lines and leaving over 600,000 students without teachers for the foreseeable future. 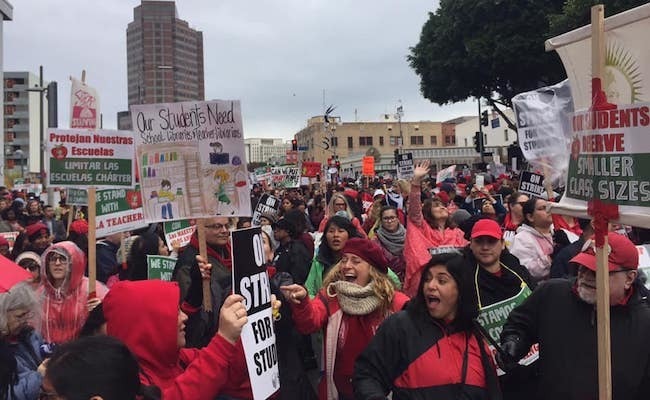 Sign the petition: Encourage LAUSD to meet the striking teachers’ demands! After trying to negotiate with LAUSD for the past two years, the teachers union finally made good on its threat to walk out. Like so many teachers across the country, they feel under-compensated: the cost of living in Los Angeles has increased by 27 percent in the past decade alone, and teacher wages haven’t kept up with that inflation at all. 1. CLASS SIZE – Some classes have as many as 46 students packed into them, which is obviously not conducive to optimal learning. Teachers want a guarantee to lower class sizes to a more manageable amount, which of course means hiring more teachers to divide the student body. 2. TOO MUCH TESTING – On top of the 10 standardized tests mandatory by state and federal law, LAUSD has added 11 more of its own. All of this standardized testing takes away from instructional time and puts too much emphasis on learning that can be measured with multiple-choice questions. 3. MORE CONTROL OVER CHARTER SCHOOLS – A lot of the city’s efforts toward improving education have been to open new charter schools, which divert both money and educational oversight to private institutions. Teachers want to ensure that these charter schools are accountable and beneficial to the overall mission, not just a way of passing public education off to someone else. 4. NURSES AND LIBRARIANS – Believe it or not, most L.A. schools do not have full-time nurses and librarians on site like you’d expect to see at schools. Instead, people who hold these positions rotate between schools, giving each school about one day per week of time. This is a silly setup since kids don’t all get sick on one pre-scheduled day, and a library that’s only open one day a week isn’t of much use. 5. COUNSELORS AND SOCIAL WORKERS – L.A. is an underserved community with most students qualifying for free/reduced price lunch. Counselors and other non-teacher supports are necessary to guide them out of the cycle of poverty and to set them up for success in jobs, higher education, etc. So no, this is not just about being paid more. If it were, the strike would be over by now, as LAUSD already made an offer giving the teachers the 6.5 percent raise they asked for. In truth, that’s an easier demand to meet because the cost of hiring all these additional staffers to make the schools better is what will really drive up the cost more than the raises. Nevertheless, the teachers, being professionals who see firsthand what helps and hurts their students, think it’s important to push for more than their own paychecks to enable student success. IS THE MONEY THERE OR NOT? The real point of contention seems to be the $1.8 billion LAUSD currently has in its educational reserves. The union says that saved amount is meant to be spent on education and could adequately cover the teachers’ demands, while the superintendent argues that money is already earmarked for future needs like teacher pensions and spending it in other ways could bankrupt the school system. Whenever each respective side crunches the numbers, their math comes out totally different, often billions of dollars apart. Until these calculations start matching up better, expect the strike to continue. If LAUSD cares about money, though, it may want to speed up the process. Schools receive state funding based on student attendance, and only about one out of every three kids showed up to school the first day of the strike. The schools are still open, with administrators and substitutes trying to do something educational in large group settings, but most kids thus far are sitting it out and the school district is losing millions per day as a result. At the same time, meeting the teachers’ demands might be out of LAUSD’s hands. It’s the state, not the city, that provides the vast majority of school funding. Securing the resources to build a more just and successful educational system would probably need to come from the state capital – not that it’d be a bad thing if schools throughout the state also saw their funding increased, too! Encourage LAUSD to meet the teachers’ reasonable and necessary demands and put them back to work in an educational system that actually works for its students. Sign the petition telling the superintendent of LAUSD to offer a good deal. The teachers of our children are VERY important.